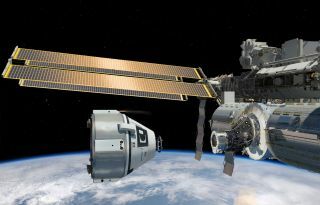 A Boeing CST-100 spacecraft is shown near the International Space Station in this artist's rendering of the commercial manned spacecraft for astronauts. The private spaceflight company Boeing has been hard at work designing a capsule that could deliver NASA astronauts to the International Space Station sometime in the next three years. And pretty soon, everyone will find out if all that hard work has paid off. NASA is expected to announce its pick (or picks) for a contract that will enable a commercial company (or companies) to fly manned missions to the International Space Station by 2017 any day now, and Boeing's astronaut-carrying CST-100 capsule is in the running. People working with the commercial spaceflight company's capsule have been working diligently to make sure that they meet their goals ahead of the commercial crew announcement. Boeing is competing with three other spaceflight companies for the commercial crew contract, technically called the Commercial Crew Transportation Capability contract (CCtCap). Sierra Nevada Corp., SpaceX and Blue Origin are also still in the running for the chance to fly humans to the International Space Station from the United States for the first time since the end of the space shuttle program in 2011. At the moment, NASA astronauts fly to space aboard Russian-built Soyuz space capsules. The upcoming announcement marks the last in a series of awards put in place by NASA in 2010. If chosen for the contract, Boeing representatives already have a specific plan for how they are will get astronauts flying from American soil aboard a CST-100 spacecraft. Company representatives are planning to launch a pad abort test in 2016, with an uncrewed flight scheduled for early in 2017. The first crewed flight to the station should take place in mid-2017. The CST-100 program recently completed a major milestone. The spacecraft made it through its critical design review of integrated systems, paving the way for the final design that could fly to space. The company met all of its CCtCap goals on time and on budget ahead of the announcement, Mulholland said. A look inside the interior of Boeing's commercial CST-100 space capsule for astronaut trips to and from low-Earth orbit. Boeing is already crafting test materials for the spacecraft, and if all goes according to plan, in October, representatives with the company will start building pieces of the capsule that could fly to space. "The challenge of a CDR is to ensure all the pieces and sub-systems are working together," Mulholland said in a statement. "Integration of these systems is key. Now we look forward to bringing the CST-100 to life." Boeing plans to use an expendable Atlas 5 rocket to launch its commercial CST-100 crew capsule into orbit on round trip flights to low-Earth orbit. The continued development of the CST-100 as it stands now is dependent on winning one of NASA's commercial crew program contracts, according to Mulholland. Without the money provided by NASA for the commercial crew program, Boeing will most likely not be able to finish the development of the capsule on the time scale planned today. "Right now, the focus of the entire team is preparing to execute given an award," Mulholland said. "Obviously, if we weren't selected, we would stand back and evaluate our ability to close the business case without that backstop of NASA development funding. I doubt that we could close that case and continue, but it is something we would look at." Boeing representatives are also looking into partnering with other companies for future spaceflight ventures to the International Space Station and beyond. Boeing is working out a deal with the space tourism company Space Adventures to fly a commercial space tourist to the space station in much the same way as tourists have flown to the orbiting outpost aboard Soyuz spacecraft. The CST-100 designed to launch toward the International Space Station atop an Atlas 5 rocket and would most likely come equipped with five seats, Mulholland said, however, NASA will need only four of those seats for astronauts. The fifth could potentially be reserved for a Space Adventures tourist bound for the space laboratory. The private spaceflight company Bigelow Aerospace is also looking to strike a deal with Boeing that would see astronauts from around the world flying to Bigelow-built inflatable space stations orbiting Earth. "We're really excited about the prospects — given a selection in commercial crew — to go out and partner with Bigelow and some other potential country or customer that might not be part of the existing space station program that wants to be a space-faring nation," Mulholland said. "So there are a lot of interesting prospects there."